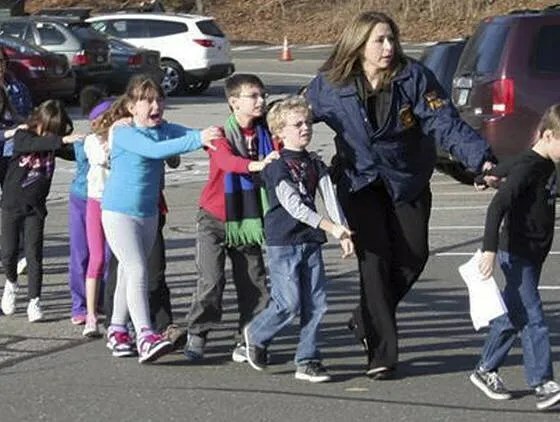 Today’s headline read, “27 dead, including 18 children, in elementary school shooting” in Newtown, Connecticut. Parents, children, brothers and sister are not coming home to their families this afternoon. They won’t be with their families this Christmas. Like most parents, I couldn’t help but hug my daughter and pray for the families of the dead. How could such a thing happen? Why does it keep on happening? When will it stop? More and more people are self-proclaimed atheists. Many others are functional atheists as they live as if God doesn’t exist. Yet if you reject God, you must reject the idea of right and wrong. You have to accept that death created us. Death becomes your god of sorts because through the death of billions of life forms the fittest survived and passed on their genes and evolved into us. So if you reject God, even the kind of death we saw today, is what created us. It’s nothing more than the “weak” being removed so the “fittest” can survive. You have to accept this if you reject God and accept evolution. Yet when such a tragedy strikes, many suddenly get religion. Their worldview doesn’t provide the answers to the questions of their hearts or they close their eyes to what their worldview actually says about death. So when something horrible happens, suddenly God is alive and real…and to blame for allowing such tragedy. Yet is this really God’s fault? Is it really his will? If someone asked me what I thought about today, I’d respond by telling them the story. While evolution says death created us, the Bible says God never created us for death. Death was never part of his plan. We were always meant to live. God created us to live in a perfect world, where we had a perfect relationship with Him. Because we were in a perfect relationship with God, we were at peace with one another. There was never any violence like we see today. God never designed us to suffer and die. Rather we were meat to live forever by his side. Yet this world isn’t perfect, not anymore. You see our first parents thought they could improve on God’s creation. They were tempted by God’s enemy into believing that they’d be better off if they were in control of their own lives. So they rebelled against God and His ways. Suddenly their relationship with God was broken, and just as quickly their relationships with each other fell apart as well. Now sin, suffering, wars, famine, disease, aging, and death hold the world captive. People even kill each other now. Yet this wasn’t part of God’s plan and God didn’t want to leave us this way. God continued to pursue His children. He continued to call them back to live a life close to Him, in His ways, under His rule and protection. Yet his children kept rebelling. All of us keep rebelling. Yet God keeps calling us. Finally, God sent his Son who was called Jesus, which means “The Lord Saves”, and Immanuel, which means “God with Us.” He lived perfectly as His Father always created us to live. Yet he died the death we deserved, because of our rebellion, on the cross. As we believe and are baptized in Him, His perfect life becomes our perfect life. Our relationship with God is restored. His death then becomes our death, so death will not hold us because death could not hold Jesus. We then have hope, on days like today, that death does not have the final word. One day, there will be no more death. The peace that the angels sang about on the night of Jesus’ birth will be realized. God’s enemy, and all who chose to follow in his ways of rebellion and refuse to be cleansed, will be locked away forever. The world will be perfect again. God will raise all those who trust in Him, will give us new life, and never again will there be any anger, fighting, wars, sickness, pain, or death. Such things won’t even be remembered. Even days like this day will be forgotten. God will wipe away every tear from our eyes and we will live in joy, true joy, in a perfect world forever more. Today something horrible happened. Yet if someone asks me why such tragedy happens, I’ll share with them the truth and “good news” of God’s story. We still mourn today, we pray fervently for the families of those who were killed, because we’re still awaiting the Restoration of things. Yet we have hope because one day God will make everything right. We sing, “Come, O Come, Emmanuel!” We pray come quickly, Lord Jesus! And we look to the day when He comes again to make everything right. What do you think of Jerome’s Presentation? What would you add or omit? What do you think of the language he uses? What parts are helpful? What part are not? What’s the benifit of knowing the Story through Creation -> Fall -> Redemption -> Restoration? How is telling God’s work this way better than just telling people about the Cross?